cod. 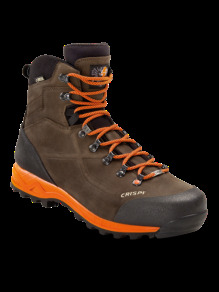 CF9270 SCARPA LEGGERA, MA ALLO STESSO TEMPO ROBUSTA E AFFIDABILE. IL SISTEMA THERMO WIRW TECHNOLOGY SVILUPPATO DA CRISPI CONSENTE DI SOSTENERE LA TOMAIA DONANDO MAGGIORE STRUTTURA ALLA CALZATURA, PROTEZIONE E SOSTEGNO PER IL PIEDE. IL PIEDE E' FASCIATO, IL TALLONE FERMO E STABILE. TOMAIA IN NABUK INGRASSATO IDROREPELLENTE, FODERA GORETEX, SUOLA VIBRAM AMMORTIZZANTE. PESO 650 GR.